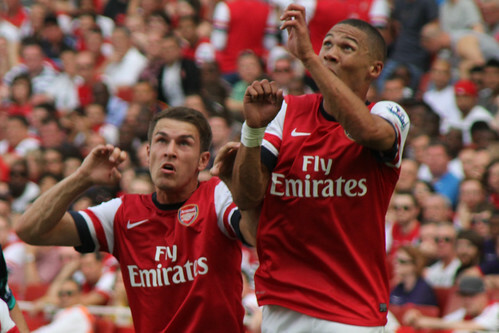 Aaron Ramsey and Kieran Gibbs are good. Sports are funny. They’re much like a relationship with an actual human. You create a bond with them, learn about them and depending who they are, you develop a variety of feelings for them. These feelings range from true happiness to utter frustration. I have a relationship with Arsenal — all 13 members of it. Right now I’m not sure what sort of feeling is going through me, which I guess in turn makes me frustrated. In a tie that was supposed to be a rather difficult test, especially with traveling to Istanbul first to face Fenerbahçe was always going to be a rocky challenge. Except, in the end, it wasn’t. Sure the first half seemed testy at times, but when it ended 3-0 and our cannon-clad hearts could beat surer after a terrible start to the season, things were looking up. Arsene Wenger stated that our "transfer window started now," immediately rousing up a new set of rumors that all seemed to be deflated in a mere weeks time. Arsenal followed a relatively easy 3-1 win over Fulham over the weekend with last night’s 2-0 sweep away of the Turkish side. In the end it was an impressive performance from a team that’s had an imaginable amount of pressure on it. With no signings yet coming in since Wenger’s declaration a strong starting 11 was again put out and as luck would have it, not all came back. Lukas Podolski was stretchered off near the start of the second half with what seemingly was a hamstring injury. While Yaya Sanogo and Ryo Miyaichi got a rare taste of first team soccer, the Turks seemed to change their strategy around the 75th minute to treating Jack Wilshere like a medieval serf. While shockingly no opposing player was sent off for their lashings, Aaron Ramsey subbed himself off, leaving his squad down to 10 men with just minutes remaining. We all said after a deep breath and a certain confidence in our voice that Wenger "will surely buy players now" just over a week ago. I’m afraid that he, our longtime boss and confidant, has no choice. But will he? It seems that all the players Arsenal have been linked with seemingly don’t want to come here, they aren’t bidding nearly enough, or London must stink of some really sour laundry. Whatever the reason is I can’t quite put my finger on it, which makes all of this, well, frustrating. It’s mostly frustrating because maybe, just maybe, if ya know, Arsenal bought a player here or there, Podolski wouldn’t have been carted away. Or maybe Wilshere wouldn’t have been the target of a large portion of the Ottoman Empire. Even Aaron Ramsey would be feeling well, in good condition instead of walking off the pitch. There was a left back playing left wing. Arsenal’s other two front three at the end of the game consisted of two rookies more or less. Of course, it’s easy to say that perhaps none of this would have happened if additions were brought in. But forcing what is essentially the same 12 or 13 players week after week, terrible things are bound to happen. The word is Podolski is out for three weeks, which rules him out of the Spurs game this weekend and Sunderland on Sept. 14 proving that an international break does have a purpose. Arsene and his Arsenal have done it again, qualifying for Champions League soccer, but at what price did it come at? Additions need to be made. With the continuing improvement of Spurs and the window closing in less than a week, this already malady-ridden season could claim more players and a chance at downright embarrassing the squad and its idealistic manager. Damned Ottoman Empire. Getting back at Gen. Allenby by kicking lumps out of Jack Wilshere.